I'm sick, at home, drinking infusions and watching old movies, covered by tons of blankets. Nothing strange. It happens. Just a kind of flu, perhaps caused by the stress for an upcoming conference and the crazy weather in Belgium. As said, I love the weather here, but I must admit that I wasn't prepared for 14°C in August. Anyway, this situation (sick and alone at home) makes me nostalgic of my real home, or better, of my parents' care when I was a child. As solution (and consolation) I began to cook some traditional dishes of the region I come from, although my mother's tradition (she's originally from Sicily) is quite different. Let's begin with "poenta e fasoi", polenta and beans. I've already dedicated a post to the making of polenta. This time I've added the long preparation required by beans. They must stay in water for 24hrs before being cooked. The polenta was roasted after one day drying on a wood board. This dish is a poor meal, typical of the countryside, when people could eat meat only once a week or even less. Nowadays it became almost posh, because suitable also for vegans. Tonight I cooked "risi e bisi", rice with green peas. That's also a traditional recipe. 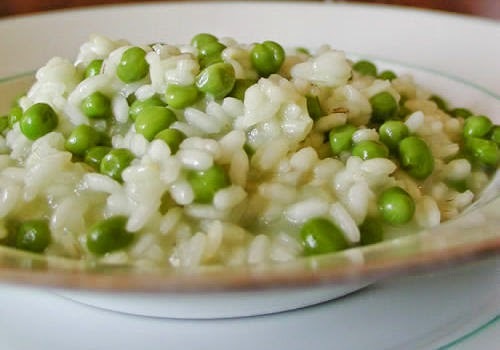 I tasted it once made with fresh peas, collected in the rear garden and cooked by my paduan grandmother. My version, with industrial dry peas hasn't the same taste, but at least smells of hometown. I payed a tribute also to the typical cooking of my mother's region, with "peperonata" and her "cudduruni" with onions. I made by myself the peperonata. It is not difficult to digest as believed. Even using the homemade tomato sauce, the taste of peppers bought in Belgium is not even comparable to those produced in the sunny Southern Italy. Amen. The focaccia filled with onions is one of my mom's specialities (she was born right in Lentini, where this recipe seems to come from, according to the linked website). The last time I went home, she baked some that I froze as soon as in Brussels. I couldn't make it by myself, first of all because I have no oven in my flat, then because it takes hours. Obviously, all sprinkled with red wine from my hometown. Food as therapy for homesickness. Ask to any Italian abroad, that's common. I might feel "Belgian" in many situations, but I cannot forget my italian roots. Enjoy your meal!